In Theory we could supply any products on the open market, however in general we will be supplying branded products the we feel confident will be here for their warranty periods. The products we supply can have different warranties available so please download their details where necessary to make sure you are happy, and should you have any questions please contact us. There are many more inverters within the range and also extra add ons such as sunny beam monitoring devices for further information please contact us. 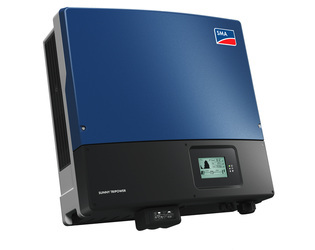 Solar PV Panels. Sharp, Sanyo, Solarworld. 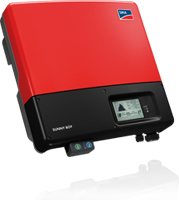 We supply as standard Sharp, Sanyo and Solarworld solar PV panels. Again there are many more on the market and we can supply a customers own choice if required, however as standard we offer the above products. We believe for longevity that these companies will be around to warranty your products and that is why we are supplying them. The Solarworld Panel is manufactured in Germany. 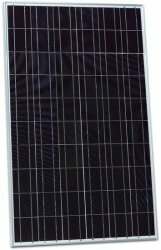 A very good quality manufactured panel in 240-275 watt variants. A Competitive product with great returns and good overall backup. These are black panels, black framed, and look very good installed with the Solarworld mounting system using black mid and end clips. Using the Solar world Panels, mounting system and our SMA Inverter we specify, this would make all major components in your installation German made. 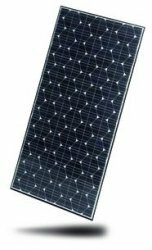 The Sharp range of panels offer a good range of wattage for your pound, they are made to a good standard, which we feel gives a good return on your investment. They are good to look at and offer a product from a company that has been in the UK mindset for many years, whom we feel will give long term support and warranty should it be required. Sharp have also launched an all black module, the data sheet can be downloaded below. 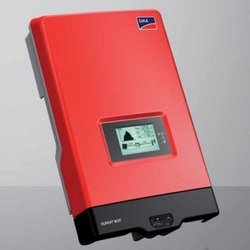 The Sanyo HIT Range of Panels are a very good overall performer, however these are probably one of the more expensive products on the market at present. We supply these if the customer requires them, but they will affect your payback time due to costs. These are however smaller in size than many other manufacturers, and therefore on some size specific installations these could be beneficial. These panels have some of the best Kw returns of any panel on the market. The Schuco range of brackets, fixings and rail, are one of the most commonly used products in the solar PV industry. They have a strong European manufacturing base, and offer good value for money, whilst offering excellent overall protection for your installation. There are many differing types of bracket for almost all types of roof and ground mount install. 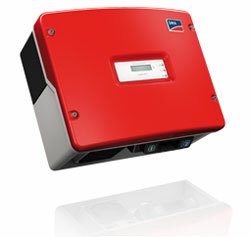 We are also an authorised supplier and installer of the Immersun unit. This unit proportionally sends surplus energy to your immersion heater from your solar PV plant. If your out or not using your energy from your PV plant, this monitors what you are using in your home and sends the power to your immersion heater, saving further money on your home energy needs. You will need to already have a dedicated circuit for your immersion heater, and a suitable immersion heater installed in your tank to benefit from this. The unit can proportionally control upto 2 circuits and also be used as a timer. 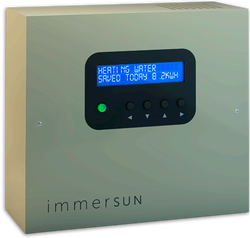 Please click here for a leaflet describing the Immersun controller, complete with our contact details. If you require any other product other than those mentioned above please contact us.